Lamigraf continues opting for more efficient processes and respectful with the environment. 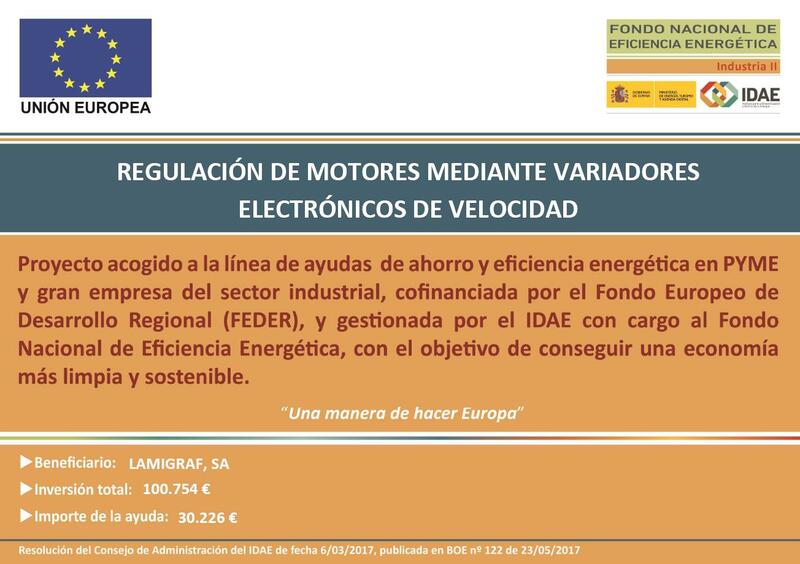 In order to support the energy saving and efficiency project “REGULACIÓN DE MOTORES MEDIANTE VARIADORES ELECTRÓNICOS DE VELOCIDAD”, Lamigraf, S.A.U have received support from the Institute for Diversification and Energy Saving (IDAE), an aid co-financed by the European Union through the Operational Programme Smart Growth 2014-2020 (FEDER). The result of this project has consisted in the incorporation of energy saving measures in productive machinery: frequency inverters have been implemented in electric motors for the regulation and optimization of energy consumption. The total investment has amounted to 100,754 euros, with a perceived aid of 30,226 euros.